Want to get an advanced degree in Sustainability? 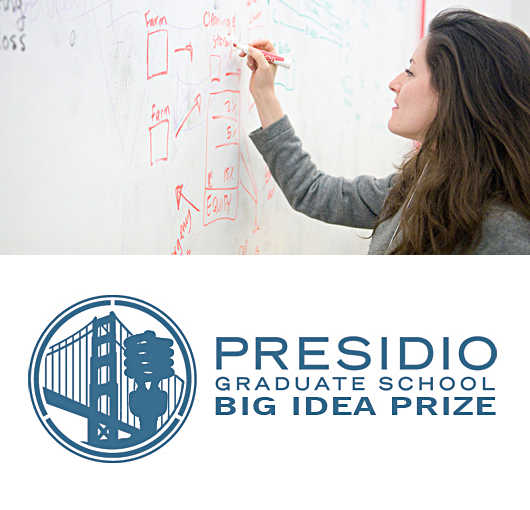 Until December 1, the Presidio Graduate School is accepting submissions to their Big Idea Prize. If you have a great idea in sustainability, the Presidio Graduate School is willing to support you by offering their educational resources at their graduate school. It is a great opportunity to get into a progressive educational program with alumni at some great places like Facebook, Salesforce.com or at cities like Austin, Texas. We talk with Ryan Cabinte, Associate Dean at Presidio Graduate School, about the contest and their program. Give the video a look on what moves the needle in the contest. "we are trying to bring planet, profit, and people together in enterprises - entrepreneurial projects in the Government or entrepreneurial projects or entrepreneurial projects in the corporate world"
"this is our way of launching somebody who has the potential of having a great impact on the world with the tools we have at our disposal"
"You got to be clear on the idea, you need a clear operations plan, you need a clear resource plan and you need a measurable outcome"
What more do you want? A free ticket to a grad school, a chance to implement an idea and learn about how to create sustainable businesses and organizations. If you win, you even get a chance at some seed money from the Echoing Green Fellowship. Their educational model is progressive and geared towards working professionals who are entrepreneurial. This is almost better than an incubator. Take this once in a lifetime chance. You have till Dec. 1 to get your idea in by email, tweet it and fill out an application to the grad school. Check them out you may be able to make your sustainable dream a reality.